The positive trade outcome at the recent G20 meeting and dovish comments by US Federal Reserve Chairman Powell are both important catalysts for a rally in Asian markets into the year-end and early 2019. So for our Livewire Christmas Cracker, we are taking a look at a very attractive buying opportunity that has emerged in Asia. Asian technology stocks are our top sector pick for investors to participate in this rally. 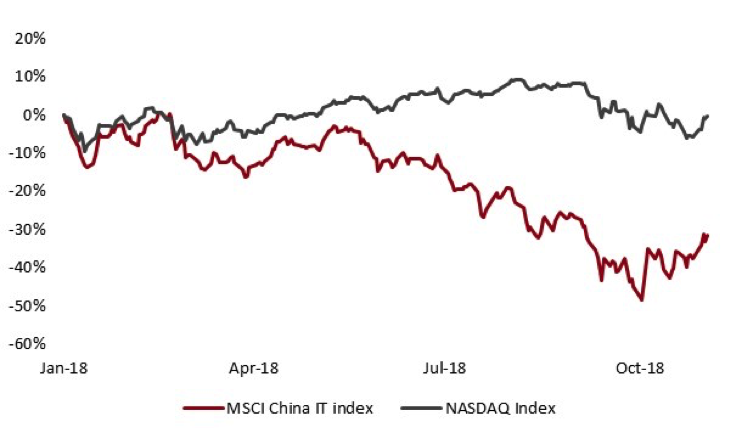 The chart below (Chart 1) shows that the MSCI China Technology Index is down over 30% since its January high while the NASDAQ is roughly flat. This divergence is extreme and China appears oversold both in absolute terms and relative to the US technology sector. The fall in Asian tech stocks this year was a function of 4 main factors: (1) Concerns about the impact of the trade war on technology supply chains; (2) Currency and flow considerations; (3) Factor rotation out of growth and into value; and (4) Stock specifics. All of these factors could reverse, at least temporarily, in December 2018 and the first quarter of 2019. The much anticipated meeting between Trump and Xi at the G20 in Buenos Aires was highly successful as the leaders agreed to temporarily halt new tariffs and the US agreed to leave the tariff rate on the existing $200b of goods at 10% for 90 days rather than increasing the rate to 25% on January 1. This event is a strong positive for technology supply chain companies in Asia that would have been hit with tariffs if the additional $267b went ahead. We have not held any Asian technology supply chain companies (except TSMC) for many months, but prior to the G20 we started buying oversold, very inexpensive supply chain names like Sunny Optical and Largan. 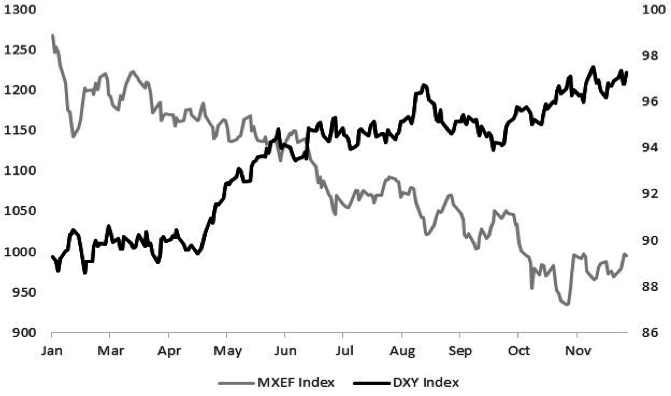 In terms of currency and flow considerations, Emerging Markets as an asset class has performed poorly in 2018 because of the trade war but also because of rising US interest rates and an appreciating US Dollar (USD) (Chart 2). However, Chairman Powell’s recent remarks suggesting that US rates are now near neutral, will provide relief from these pressures. Note that 5 of the Top 5 weights in the MSCI Emerging Markets Index are Asian technology companies (Tencent (4.7%), Alibaba (4.1%), TSMC (3.7%), Samsung Electronics 3.7%) and Naspers (top shareholder of Tencent at 1.8%). So passive flows back into EM will benefit this sector disproportionately. With respect to factor rotation, the last few months have seen decade high rotation out of growth and momentum stocks into value stocks. The MSCI World Growth Index is down approximately 9.0% since the beginning of October versus the MSCI World Value Index which is down only 4.3% over the same time frame. Obviously technology stocks get hit hard in this type of rotation because they trade at high PE multiples and generally have low or no dividend yield support. We see this as transitory and expect value to underperform growth in the next few months. In terms of stocks specifics, the charts below show that China technology mega caps like Tencent and Alibaba are trading one standard deviation below their long term averages. Tencent in particular has a stock specific catalyst on the horizon if online game approvals resume by the end of 2018 or in the 1Q19. Pre-G20 we increased our position in Tencent. The above points highlight that the Asian technology sector, particularly Chinese tech stocks, have become oversold. We see good buying opportunities in Tencent, Alibaba, Baidu, Largan and Sunny Optical for the rest of 2018 and the first quarter of 2019. Once the 90-day trade war truce is over, we will reassess these positions, but for right now, valuations are too good to miss. Our investment approach is designed to focus on opportunities the market may have overlooked – exploiting inefficiencies by identifying stocks that are temporarily misunderstood and fundamentally mispriced. Find out more.